Essenz is a new shoe designer to me, and they have several pairs of nicely done sandals for Slink feet, named after various world cities, at Fashion for Life. First up is the Tampa, a simple summer flat sandal, and a good addition to a capsule wardrobe. It's available in six basic colors. Next is the Detroit, classic high heeled dress sandal. Again, a worthwhile addition to a capsule wardrobe. There is also a limited edition of the detroit, which turns the loop part of the strap into a "Breast cancer ribbon", a nice little touch. I'm thinking about purchasing the Geneva sandals (strappy dressy slingback sandal) and one other pair as well. Fashion for Life officially opened yesterday, I popped in for a bit today. But I'd recommend holding off on visiting for when the event is less busy (try late nights and early mornings than prime-time US), that will help reduce lag times. But please do go, and support the Relay for Life. I'm not usually very boho, but the moment I put this Adrift dress from even.flow on, I said, "This is the sort of boho dress even I can love." I'm going to tell Salome about it too, she adores boho, if she doesn't have it already. Now I'm not sure, it may be a template, but this dress is very well done. Fatpack comes with 4 dress color combinations with belt color options. Yes, you can have it all black if you want it. Poet's Heart is a store I only know of in passing, IIRC via The Blogging Elf. I was up at the Blogger platform (which is basically "press central" at FFL) and saw someone else wearing this Wayfarer tunic set. I believe my elf-loving Squee reached the soprano register. Basically it's a mesh tunic and legwarmers (the pants are texture). The small size fit well on me, but the fitted mesh variants did not work well with my Slink hands. 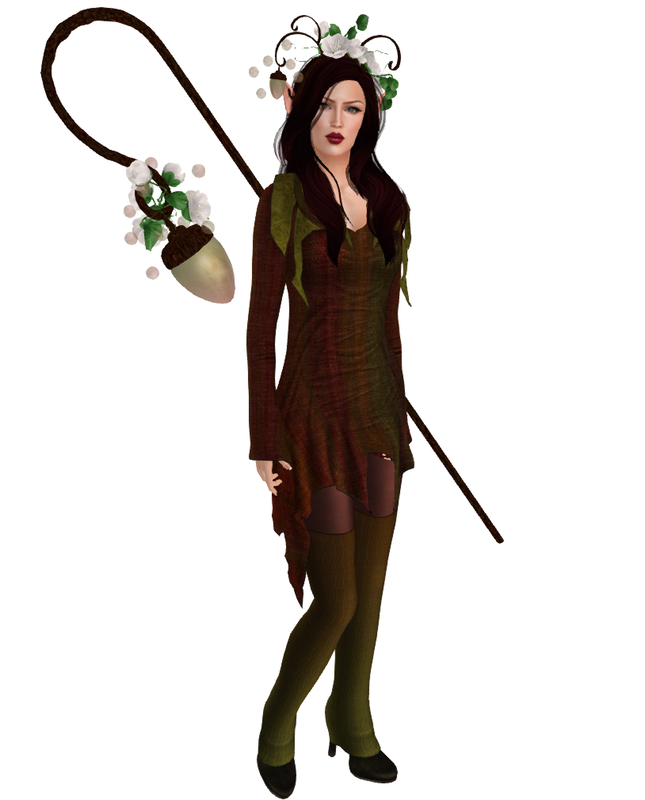 Also available is the staff and headpiece. Yesterday, a friend of mine was looking for a Frozen style cosplay gown for a mutual blonde friend of ours. We found a few on marketplace....but today Poet's Heart had this Solitude gown in this "Arctic" color in the FFL blogger items. Elsa eat your heart out. This is fairly well fitting mesh and it comes in more colors. Purple Moon Time Traveller at Fashion for Life. If you're a lady of the Steamlands, when Fashion for Life opens on June 7th you need to run right on over to the Purple Moon stand and buy this Time Traveller ensemble. Of course every other Steamlands lady will be buying it too, but that's okay, you want it anyway. It's going to be a lemming run for sure. It's actually not a dress but a skirt, jacket/top, shoes (which I'm not wearing, issues with the alpha) and the hat. The jacket has a bit of ruffle at it's bottom, from what I can see it's supposed to show a touch of skin as you move. So far I've only seen it in this brown but I do believe other colors will be available. Except for the shoe alpha issues (which is why I'm wearing the new mesh Tesla Ziggy's which are so perfect for it), it's well done mesh, and I'm loving the texturing and shading. If it comes in black, I will be picking that up on my own for sure. Fashion for Life started up what I think of as the press-centric pre-event today. The regions are open for the Blogger-press, and the designers continue to feverishly work on the regions, their vendors and adding more goodies. It cannot be said enough, that this year EVERY sale contributes to the Relay because EVERY vendor is an RFL vendor. So you don't have to make a choice between buying a cute dress from an RFL vendor and one that wasn't like one might in years past, it's ALL good this year. store named Moolala that I hadn't heard of before. Being a former cow-dancer, the store name made me giggle (the mascot is a cow) so I took a look inside and found this Milla Scrunch dress. At first I thought it wasn't "me" but I changed my hair and decided it was a cute little dress well worth showing off since this sort of thing can be a versatile little beachy party dress. The fit is good, the texturing is good, and it is well worth demo-ing once FFL is open. No, I will not be talking about the obviously gacha'd Truth Sakura hair and Ingenue Jolie shoes in this post, that is another long story. There were other things, but I really want to show off this Rylee jumpsuit ...that strikes me as 70's barbecue party wear. At first I wasn't fond of the ruffle rigging, they're static, but then I decided, that it didn't bother me as much as I thought it would. That's because it's just a "happy" outfit. Comes in black too, but I like this version because it's just so happy. The mesh fits well, like the Milla above. I'm known for being a crankypants about many things, but there is one thing I'm crankypants about that totally deserves it.... Cancer. I really have it in for cancer. My father was a prostate cancer survivor, two of my aunts were killed by it, another aunt was found to have had it during an autopsy, an uncle died from it, a cousin is a survivor, a long time family friend that was an "honorary aunt" died from it, coworkers have had it, long-time acquaintances have had it....lets just say I'm not overly fond of it. In RL, I've been an RFL supporter for years, my mother got us started on that. She'd zip around that relay track in her wheelchair. I entered SL on July 19th 2006....an RFL day but I didn't know the RFL was in SL it till after it was over. Once I found the RFL was here, I basically had a squee moment and did my best to support RFL efforts. I'm currently a member of Team Caledon, I'm not a builder or organizer, I just give moral support and try to help where I can because.. in SL..and in Caledon ...well there are people I am very very fond of, who are survivors and some we have lost to it. Readers also know there is one thing I'm not crankypants about most of the time and that is Shopping in General, so imagine an event where I could combine two of my favorite things: Fighting Cancer and Shopping...well that would be an event made of Total Awesome. Isn't it wonderful that such even exists in the Fashion For Life event? Every year, fashion designers make stuff, put it in some RFL vendors in Fashion for Life regions (10 this year) and sell it to shoppers. Shoppers get neat, and often RFL themed items, and their L$ gets donated to the cause in Very Large Amounts. Win Win for Everyone. You might be thinking, "CC, you're not fond of location based events". That's true, but this is a once a year thing for a cause, and it's one of the more pleasant "big" events in SL, rivaling Hair Fair in just simple shop-ability and fun. I always have fun at FFL, last year a bunch of us Caledonians ran into each other there...we didn't know we were all there and we spent a pleasant time shopping and talking. Fashion for Life, or FFL for short, runs from June 7th to June 20th. That means it starts this weekend. You will go there, you will shop, and by doing so help fight cancer. But when it comes down to it, I'm not blogging about RFL in SL or FFL for the shopping, I'm doing it for all my SL friends who are survivors or whom we have lost to cancer, I Relay in SL for You.